A Real-Time Window Into Zika Research On A Pregnant Monkey : Shots - Health News It's rare for researchers to share their data as they work, but scientists in Wisconsin are reporting on their Zika virus experiments in real time. They say it's critical for stopping the virus. 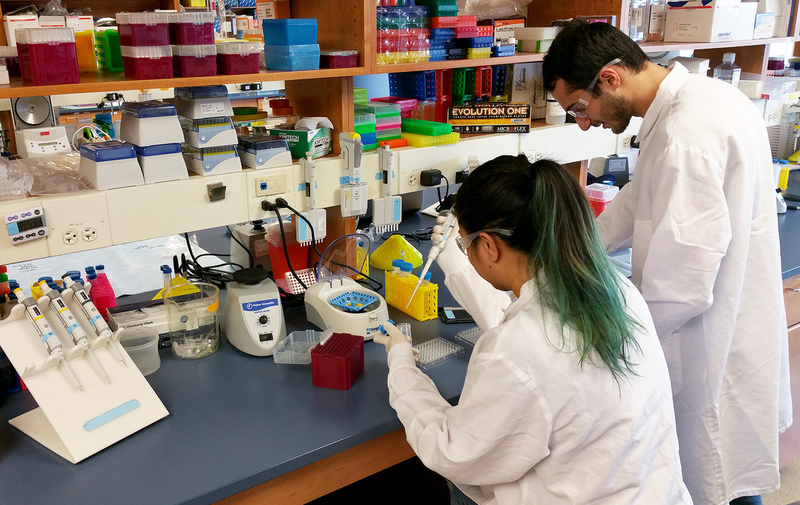 Mariel Mohns and Mustafa Rasheed are working in a University of Wisconsin lab that's trying to figure out how Zika virus could be damaging fetuses. Researchers in Wisconsin injected Zika virus into a pregnant rhesus macaque monkey on Monday, to start exploring how this virus can affect the brain of a developing fetus. 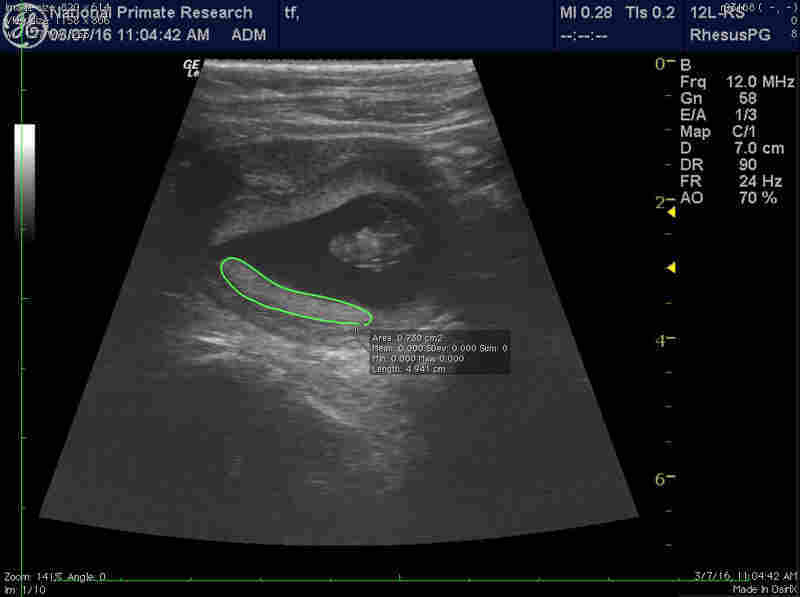 Over the course of the coming weeks, the team will be posting the infected monkey's ultrasounds and blood tests, as well as other data such as the amount of virus in the amniotic fluid. The study is being led by Dave O'Connor, a professor at the University of Wisconsin-Madison who is also writing a running commentary on the laboratory's website that frankly discusses things like the emotional impact of looking at this primate's ultrasounds. O'Connor says that he can feel a moral need to do this kind of animal research and at the same time feel "sad and heartbroken" at what the work entails. "I don't think those two are mutually exclusive," he says. He and his colleagues have been planning these monkey experiments for months. A couple of weeks ago, when he was in Rio de Janeiro, he kept seeing pregnant women on the street. It really hit him that all of them were potentially at risk of Zika, which is suspected of causing microcephaly and other devastating birth defects. "I've come to the conclusion that there is an ethical and a moral imperative to study the most relevant animal model to get the most impactful and valuable data," says O'Connor. And making sure that the data has the biggest impact is why he's releasing it right away, letting strangers follow the experiment as it happens. Courtesy of Michele Schotzko and Ted Golos of the University of Wisconsin - Madison. This kind of openness is not the norm in biology. Usually researchers would collect data, analyze it, maybe present it at a conference, and eventually submit a manuscript to a scientific journal. The findings might not get published for more than a year. "In the case of a public health emergency like Zika virus, the journals are aware that there is certain urgency to communicating the results," says O'Connor, "but that process can still take weeks to months." He didn't want to wait. Doing the experiment publicly means that other experts can contact him and suggest changes or offer help. Plus the early results could maybe help other groups better plan their own Zika studies, so they could get results faster and use fewer animals. "I haven't seen a researcher before essentially publishing all the raw data from experiments. I think that's great. That's certainly new to me," says Kristian Andersen, a biologist at The Scripps Research Institute. During the Ebola outbreak in West Africa, Andersen and his colleagues sequenced Ebola viruses taken from patients and made that genetic information public unusually fast — within 48 hours of generating it. "My take on it is that for public health emergencies like Ebola, like Zika, it's really a no-brainer," says Andersen. "The data has to be made publicly available as soon as possible." Still, this kind of rapid data sharing is so new, there's a lot that isn't yet sorted out — like how to make sure scientists get proper credit for their work, even if it's not formally published. "You're seeing a shift, as you are in many other aspects of culture, where information can be shared much more broadly and much more quickly than it ever could before," says Thomas Friedrich, a researcher at the University of Wisconsin, Madison who is collaborating with O'Connor on the Zika experiments in monkeys. "Part of what we're testing here is the viability of real-time public data sharing." He notes that one recent paper in the New England Journal of Medicine used unpublished data on Zika virus genetic sequences that had been deposited in a publicly available database. Some felt that the group in Brazil that originally obtained those sequences was not given enough credit in that publication. "That's caused a bit of controversy within the field, partially because there are no rules about how to do that," Friedrich says. "By the kind of standard rules, the researchers who wrote the paper didn't do anything wrong in taking publicly available data and doing their own analysis with it." On the other hand, he says, there's a growing appreciation for how researchers in developing countries may not get enough credit for their contributions, and there's an obvious need to make sure that these scientists can contribute to rapidly moving science without the fear of being shortchanged. Friedrich says he wouldn't want to rush into recommending that everyone go public with their experiments, but doing this monkey study out in the open seemed right to him — at least in the urgent context of the Zika outbreak. "I understand that not everyone in science is going to feel the same way," says Friedrich, "and because we don't have codified rules and because we don't have established norms, the level of data sharing that each individual scientist thinks is appropriate is going to vary widely." But O'Connor hopes that if this experiment in transparency goes well, it might embolden others to follow their lead. "We don't know how it's going to be received," says O'Connor, "but trying new things and seeing what happens is important in its own right."